Spencer Platt/GettyAlexandria Ocasio-Cortez in New York City on July 12, 2018. Millennials are embracing socialism and have a particularly negative view of President Donald Trump, according to findings from a new BuzzFeed News and Maru/Blue poll. The poll indicates nearly half of all American millennial Democrats (48%) identify as democratic socialists or socialists. Additionally, the poll indicates a majority of millennials disapprove of the job Trump is doing as president. Millennials are embracing socialism and have a particularly negative view of President Donald Trump, according to a new BuzzFeed News and Maru/Blue poll. 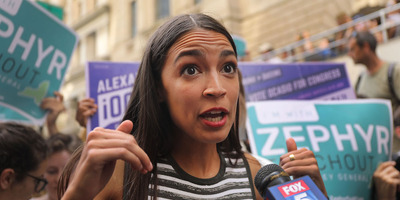 Roughly one out of three millennials (31%) say they are a democratic socialist, a socialist, or would identify as either, the poll showed. Meanwhile, the poll found nearly half of all millennial Democrats (48%) identify as democratic socialists or socialists. The new poll, which ran from September 21 to 24 and questioned people between the ages of 22 to 37, also found millennial men are more likely to identify as democratic socialists or socialists. Overall, 39% of men identified in this way compared to 22% of women. Additionally, the poll indicated 28% of millennials would actually be more likely to vote for a candidate running for political office if they were referred to as a “socialist,” while 27% said they would be less likely. And 22% of millennials said it would make no difference to them if a candidate was a socialist. At the height of the Cold War, it would have been unimaginable for so many young American voters to indentify as socialists or support candidates who indentify in this way, but things have clearly shifted since the fall of the Soviet Union. According to the new poll, Trump is also quite unpopular among millennials. Overall, 52% of those surveyed disapprove of the job Trump is doing as president, compared to 34% who approve, the poll found. What’s more, the poll indicates 60% of millennials would support an effort to impeach Trump.